Cimabue, by Dawn Spencer Hurwitz, is today's topic, but to talk about Cimabue we need to start with yesterday's Safran Troublant. Of the three fragrances in the L'Artisan Les Epices trio, Safran Troublant was the one that originally garnered the most attention on the fragrance board at MakeupAlley. Early on, the only way to get the fragrance was to buy the complete Les Epices set, which included Piment Brûlant and Poivre Piquant, and which was originally released as a limited edition. This was a problem, obviously, if you A) didn't like Piment Brûlant and Poivre Piquant and/or B) adored Safran Troublant to the point where the little 15 ml bottle in the coffret simply wasn't enough Safran Troublant to tide you over for the rest of eternity. Chattykathy, who at one time was a frequent poster on MakeupAlley's fragrance forum, was firmly entrenched in group B. She may have also been in group A (I neglected to ask) and I hope it goes without saying that Chattykathy is her screen name, not the name she uses in everyday, offline life. She decided to take matters into her own hands, and sent a sample of Safran Troublant off to perfumer Dawn Spencer Hurwitz in the hopes that Ms. Hurwitz would devise a reasonable facsimile and that she, Chattykathy, would never have to go without. Cimabue is the fragrance that was born out of this confluence of events, and if it was merely a dupe of Safran Troublant, it would hardly be worth considering at any length, but in fact, it is a rather different take on the subject of saffron and an interesting fragrance in its own right. The notes include bergamot, bitter orange, cardamom, clementine, neroli, lemon, nutmeg, carnation, cinnamon, clove, rose geranium, jasmine, honey beeswax, rose, sandalwood, saffron, tuberose, ciste, sandalwood, labdanum, opopanax, benzoin and vanilla. The first thing you might notice is the very long list of notes in comparison to the four listed for Safran Troublant (saffron, sandalwood, rose and vanilla). Of course, lists of notes are just that, lists of notes. They are meant to provide helpful clues, but they aren't recipes, and they are rarely complete. So it is perfectly possible that Safran Troublant actually contains more ingredients than Cimabue, but in this case, the lists give a rather accurate impression of the difference in how the two scents wear on skin: Cimabue is a considerably deeper, richer, and more embellished fragrance. Of all of the fragrances I've tried by Dawn Spencer Hurwitz, Cimabue is the most compelling, although I should qualify that by saying that I've only tried a mere fraction of her extensive line. I should also point out that Cimabue is listed on the Dawn Spencer Hurwitz website, ironically enough, as a limited edition, so if you fall in love with it, you may end up with worries of your own. Cimabue is available in a variety of forms ranging from a .25 oz Eau de Parfum travel spray ($27) to a limited edition flacon of Parfum ($135, photo shown above). Samples are sold for $4 each. For buying information, see the listing for Dawn Spencer Hurwitz under Perfume Houses. Thank you, Robin for your wonderful story about this beautiful fragrance. I have a bottle of the EDP and just treated myself to the limited edition Parfum. I had no idea that the lovely “chattykathy” was behind the creation of Cimabue, but knowing that now it does not surprise me. She is creative and outspoken, and possessed of a tremendous passion for fragrance. Personally, I prefer Cimabue to Safran Troublant, since it is more complex and has better staying power. 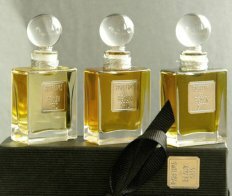 DSH Perfumes are wonderful, and worthwhile to sample as many as you can! I've hardly sniffed any of the DSH line (no matter how much progress I make, how can I have so many huge gaps in my sniffage?!) You've now given me an EXCELLENT place to start, thanks. It sounds like exactly something I'd love. I have only worn it 4-5 times so far, but unlike Safran Troublant it hasn't annoyed me, so perhaps I like it better too! What are your other favorites from DSH? A, I can see how it would be overwhelming. It is odd, because I usually like lighter things but in this case, it is the Safran which I sometimes find overwhelming. Still haven't really pinpointed why that is, but sometimes it seems lovely and sometimes it bothers me. I'll never manage to smell all the DSHs no matter what I do, so I'm always asking people what they think is best. I did like Mahjoun (sp?) too, although not as much as this one. Winter White also has lots of fans on MUA but it did nothing for me. Mahjoun is a favorite, but my all-time favorite is her Piment et Chocolat. It is the most interesting chocolate fragrance, and as with Cimabue, very well done. I do have a fair number of her oils; mostly of the gourmand variety. Cardamom and Kyphi is a good one, so are her vanillas. Some of her musks are wonderful as well: Little Smile, Evolution and Old School Musk. One of her newer ones, Le Chevalier d' Automne is a very interesting and comlex leathery scent. Thanks. I liked Mahjoun too, although not as much as Cimabue. Should retry C&K, and am now tempted by “Old School Musk” — that is a great name! DSH offers really reasonably priced sampler packs that are a great introduction to her line. Here is the link. it's a great fragrance and while i tried it in the spring, i think it's an autumn fragrance — i wore it thru as soon as i finished the lutens sa majeste. now that it's winter i'm finishing my l'heure bleue and next week will go on to mitsouko. i will be very interested in sampling the cimabue, because i love the ST a lot! I agree, ST wears much better in cold weather. I think it is mostly when it is hot that it bothers me. Do try the Cimabue, you might love it! thanks for encouraging my outrageous perfume habit, robin! i will order a cimbue sample. this leads me to ask: should i be ashamed of my slight foodie tendencies? there are only 2 or 3 foodie scents that appeal to me, but those that do. . .do. it's the vanilla. i'm a prisoner of vanilla. . . I don't see why you should be ashamed of *any* fragrance-related tendencies — we like what we like, and why not? Do let me know how you like the Cimabue!